Researchers and practitioners know quite well how to handle performance in classic environments involving a strict separation between Dev and Ops. 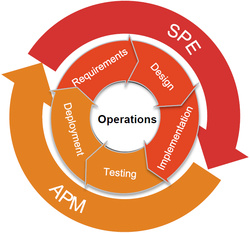 DevOps aims on merging these silos and on automating the delivery pipeline and operations. Performance is often left out in such scenarios as the requirements for a holistic performance evaluation are hard to fulfil in fast and automated delivery pipelines, yet not impossible. This survey is part of a larger project aiming on building best-practice infrastructures for Performance-aware DevOps. If you'd like to get further information about our mission, watch our talk talk from the DevOps Days in Kiel 2016. We would like to know which tools you use and find useful as well as how a typical delivery process looks like in your company. The survey consists of up to 43 questions and takes about 15 minutes. The results will directly affect the open-source references infrastructure we are building. You can also receive the results before all others, if you leave your e-mail address at the end of the survey. This survey is a project of the DevOps Performance Working Group of the SPEC Research Group. It is a non-profit research project and helps us and others understanding state-of-the-art practices in (performance-aware) DevOps better. You're participation is well appreciated. Thank you for your time. There are 43 questions in this survey.